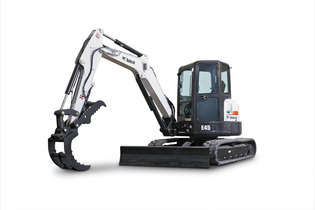 Looking for rent a Bobcat E45 Mini-Excavator in Rochester NY, Ithaca NY and Western New York? The Duke Company is proud to feature Bobcat Mini Excavator Rental equipment. Load sensing hydraulics for smooth and predictable joystick operation. Operating weight = 10,077 pounds. Travel Speed at Maximum = 2.6 miles per hour. Arm digging force = 5,332 pounds. Bucket digging force = 7,650 pounds. LIft capacity (rated) = 5,131 pounds. Digging depth at maximum = 10.8 feet. Dump height at maximum = 11.9 feet. Reach maximum at ground level = 18.6 feet.